I’ve never been a huge fan of Big Bang Theory… and this surprises a lot of people. I’m often told things like “I’ll bet you love that show” and “oh come on, that’s so you!” And I think that’s one of the things that bothers me about it… I mean, I’m a geek, nerd, whatever you want to call it, and that’s cool. I guess I just don’t like to see that exploited so unabashedly. It makes it feel like they canned it, and made it a spectacle, and that doesn’t sit right for me. On a positive note, it seems to be reasonably well-written (relative to most sitcoms), for the few episodes I’ve seen. And they appear to do their research. So I guess I won’t complain too much about something that’s ultimately helping with “acceptance” of geek/nerd culture. Even if it does trivialize it at the same time. 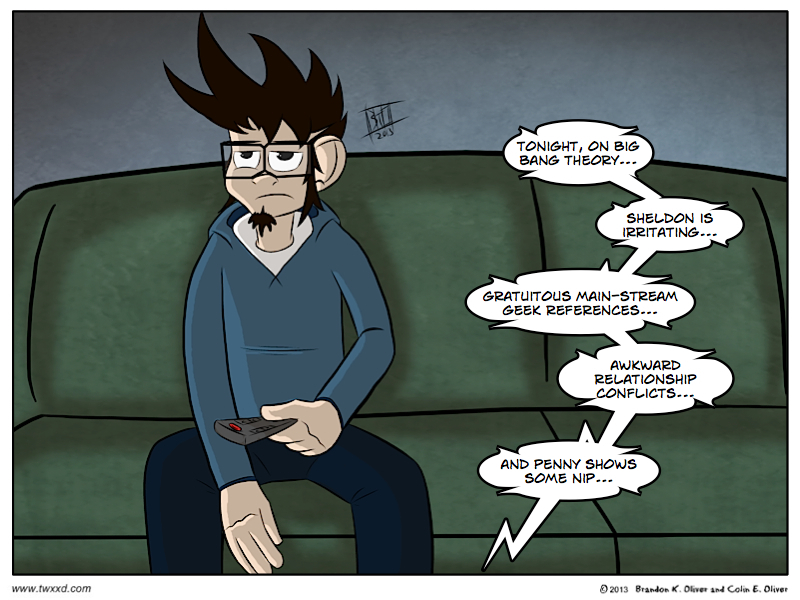 For some balance here, I actually like Big Bang Theory. I came up with this idea while watching it. It’s basically a live action cartoon to me, and I think that’s why I like it. But, it’s patterns really are very obvious, which means the show runs the risk of getting old (which I’m aware has already happened for a lot of people). Regardless, I’m still going to keep watching it for a cheap laugh. I think the show has really improved and is more interested in their relationships than in the geek jokes. Sheldon remains very much a genius borderline asperger’s syndrome case but the other characters are much more 3 dimensional. I haven’t watched it enough to really agree or disagree, but what I have seen spans several seasons, and that’s how I feel. Sometimes it is clever, other times it feels like they are bashing some of the people they are trying to get interested in it (target market I think?). Personally, I enjoy it, but am not fond of when they making inaccurate gaming references. Yes! Exactly. The bashing thing is unsettling. You can live it with your friends, or watch actors go through the written motions. I prefer to live it myself. Wow… that is a fantastic post. It takes my barely developed feelings/opinions on the show and elaborates, backed with well-argued points and facts. I especially like the contrasting analysis of Community. Thank you, Wrecklaimer. Love me some Penny nip! I completely agree, Coliver. I like the show, but it feels canned, sometimes. The thing that gets me the most is when they get things wrong. I have trouble getting into the episode when it is based on a premise which has a two minute fix.